Yall, I feel so blessed and lucky today. Just 2 years ago, I heard an episode on one of my favorite podcasts, Conscious Chatter by the amazing Kestrel Jenkins. It was a conversation with 3 conscious bloggers, one of them being Valeria Hinojosa. At this time, milo+nicki was barely a month old. Our brand had a name and mission, but nothing else. I didn't know where I was headed, I didn't know how I was going to launch a fashion brand with little experience in the industry, and I was terrified and excited about starting a new chapter in my life. When I heard Valeria share her story and journey, and how she came to launch her conscious blog WaterThruSkin, I couldn't believe how similar our backgrounds were. It gave me so much confidence and pushed me to believe in myself a little more. As I followed her blog and Instagram, I began to see her passion, resilience, and humility shine through what she did. But, above all, her kindness made me want to get to know her. When it finally came to launch day, ironically enough, I was able to do my first photo shoot with Kestrel who pushed me to reach out to Valeria. Valeria Hinojosa is a vegan, yogi, social entrepreneur, and risk-taker. 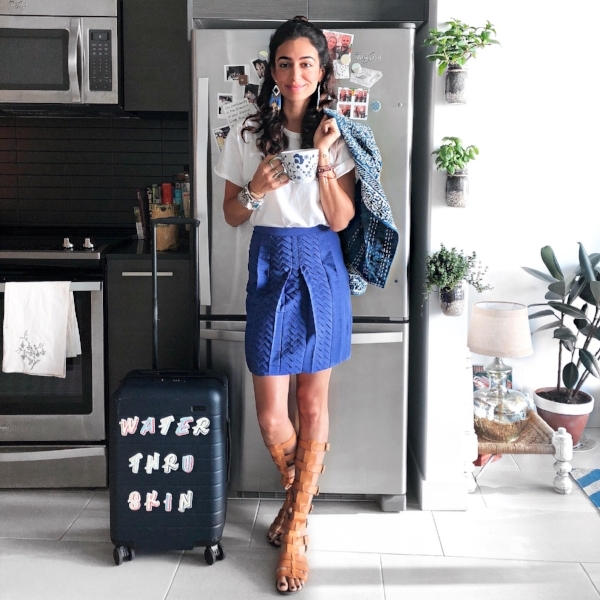 She worked in the private banking industry as a VP for almost 5 years until she left her career to begin WaterThruSkin, a conscious lifestyle blog in Miami. Since then, she's been traveling the world visiting the most exotic, eco-friendly, and soul-enriching places not only to acquire a vast knowledge of different cultures, green design, and plant-based cuisine but also to promote new sustainable and ethical brands, products, and hotels she works with. In the past 4 years since WTS' inception, Valeria and her team have reviewed and promoted over 300 brands and hotels worldwide. 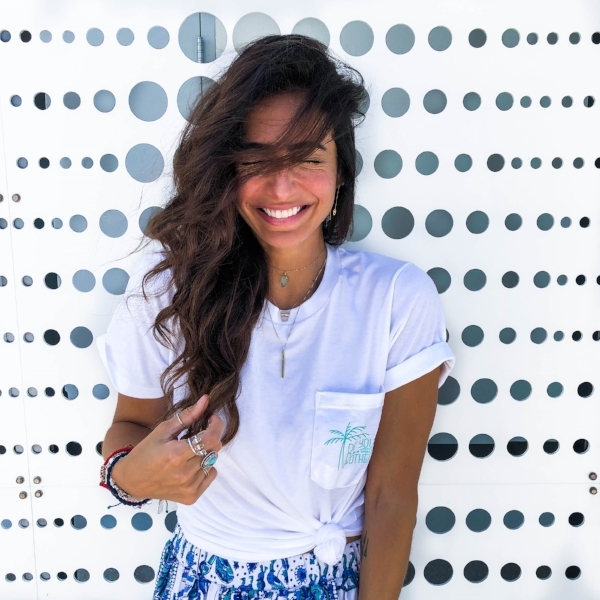 In 2017, Valeria also founded WTS Connect - the first conscious blogger agency with a reach of over 22 million worldwide consumers focused on sustainability and ethics. What is your favorite food/dish (because I love FOOD)? What does it mean to you to be you in a world of others? It means to feel comfortable in our own skin. That has been my toughest battle. Like a lot people, I was born in a body and environment I had a hard time connecting with. Society, expectations, billboards and magazines made it even harder. As naive human beings, we tend to see beauty as a physical thing when true beauty shines from the inside out. We are used to judging a book by its cover because it’s easier than asking a stranger out for a cup of coffee and taking the time to hear their story. We jump into assumptions easily and tend to associate nice smiles, pretty faces and a cheerful attitudes with a perfect and easy life. But if you dig deep enough...soul deep...you’ll soon discover that this assumption is not always the case. It took me 27 out of 30 years to learn to love myself fully. 27 years of mental battles, discovering and accepting the darkest corners within me, finding bliss in vulnerability, healing scars, and connecting with my essence so I could finally understand that the direct path to genuine happiness hides in chasing my own passions and dreams. What is one piece of advice you would give your younger self – about life, career, hopes/dreams, anything? All those things you’ve been dreaming since you were little….do them now! Chase them now. Life goes by in the blink of an eye. Don’t waste it chasing someone else’s dream. Create your own paradise instead. What would you tell someone who is trying/struggling to find themselves in the chaos/noise of the world? The world is noisy, judgmental, and sometimes too hard to deal with but if we are at peace with ourselves and in love with the person we see in the mirror every morning, we get to fly over all this noise like superheroes wearing capes of light! And just like this, we transform our biggest challenge into our greatest achievement because we finally get to be whatever our souls have been aching for for years. We give our spirits wings and set them free. And there is nothing more beautiful than a human not afraid to be herself/himself every second of every day. Don't forget to shop our unisex Be You tees! Rock the tee, share our motto, empower others, & giveback!